NEW! Introducing a simply beautiful two-step treatment for fuller, rosier, softer lips. 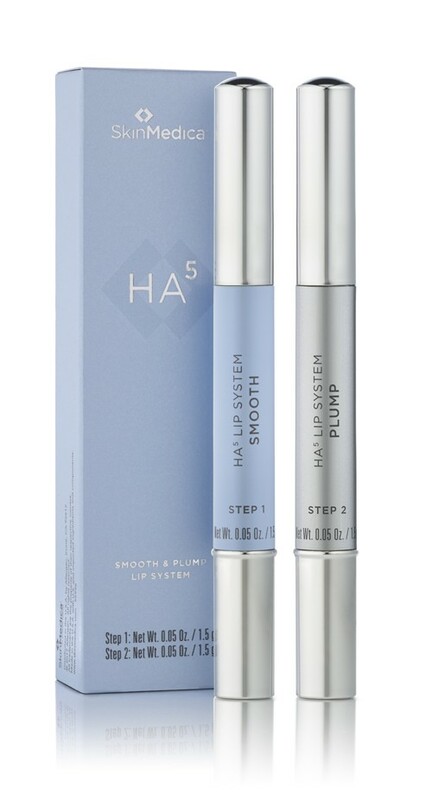 SkinMedica's HA5 Smooth & Plump Lip System uses the same breakthrough blend of 5 forms of hyaluronic acid as the bestselling HA5 Rejuvenating Hydrator to provide maximum hydration and plumpness to your lips, with immediately-visible results. Over time, you'll feel a noticeable difference in your overall lip texture and condition and see improved color and contour. Step 1 (Soothing) uses a potent, proprietary mix of vitis flower stem cells, peptides, and polysaccharides to support healthy, rejuvenated skin. Step 2 (Plumping) combines the healing and hydrating powers of hyaluronic acid with benzyl nicotinate, an ingredient that boosts fullness and rosiness. Together, they support your skin's ability to replenish its own HA for healthy, smooth lips with reduced appearance of fine lines and wrinkles. Use this clinically-tested system daily to give yourself lips worth smiling about! If you have a Brilliant Distinctions® account, you could earn 25 points on this purchase. Join now. How to Apply: Use the smoothing pen (Step 1) to apply over your entire lip area and around the edges of your lips. Allow it to fully absorb, then use the plumping pen (Step 2) inside your lip line. For best results, use 3 times daily. You can apply it over or under lip color, and in between cosmetic injections.